The buzz over recently exposed timbers of the “King Philip”, a clipper ship which foundered at Ocean Beach in 1878, got me thinking about San Francisco’s legacy of maritime corpses — especially those which ended up becoming part of the foundation of the city. I’m talking about the ships buried underneath downtown San Francisco. Hordes of souls poured into Yerba Buena (As San Francisco was then known) in pursuit of gold, the vast majority arriving by ship — and for many of these watercraft the Gold Rush proved to be a one-way trip. By the end of 1850 over 500 were floating in the harbor, with countless more arriving every day. Their crews were only human, of course, and — hardly immune to the lust for gold — many simply abandoned ship and headed for the hills. 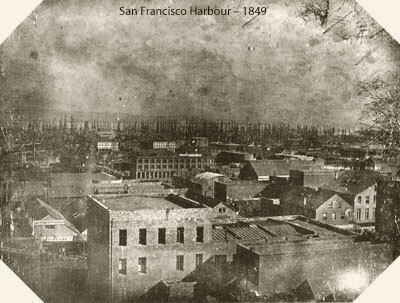 The harbor in Yerba Buena Cove was soon choked with abandoned vessels being scavenged for lumber, rotting, and gradually sinking into the bay, forming the bulk of the landfill upon which modern downtown San Francisco is built. Some ships didn’t sink, and lived second lives as ad hoc shops, hotels or brothels. One of the most famous of these is the Niantic, a ship dragged to the corner of Clay and Sansome in 1849 for use as a hotel. She was buried, burned and built over, finally rediscovered in 1974 during excavation for new construction. A number of artifacts found during that dig, including cases of French champagne, are now on display at the wonderful National Maritime Museum in Aquatic Park. Unlike the “King Philip”, which has been popping up and drifting back under the sand irregularly since its unceremonious demise, the ships underneath the asphalt and concrete of the modern-day Financial District don’t appear unless we dig. In the old Yerba Buena Cove area you can barely drop a spade under the streets without striking old timber. I peeked over the fence at the excavation for the recent construction at Spear and Howard just to see what I could see, and sure enough — there were the decaying timbers of yet another historic ship. I wasn’t surprised — they are everywhere! I love walking around the old harbor area knowing that there’s history buried just underneath my boots. But without X-ray vision, how are we to know what’s down there, and where? Well, Ron Filion over at SFGenealogy.com has compiled a close-to-definitive map showing the locations of dozens of ships, as well as the location of the Yerba Buena shoreline back in 1849. It’s a nice hi-res image, great for printing and and taking along for a summer stroll with the ghosts of the maritime 1850s. On the other hand, if you want to get your feet wet, there are hundreds of ships lying in the waters offshore. For excruciating detail and locations of these wrecks, download the Submerged Cultural Resources Assessment, covering the waters of the Golden Gate Recreation Area, the Farallones, and the Point Reyes seashore. For a trip like this, you’re on your own! P.S. I’ve seen Californio-era maps showing the wreck of a floundered ship just off the (former) mouth of Lake Merced. Chris, thanks for the tip about the bad link. Looks like Ron’s server no longer allows direct linking to graphics, so I changed the link to point to the actual page on which the map lies. That’s probably better form anyway!